Posted on May 1, 2018 by Dr. Nikhita De Bernardis. Does your cat have a chronic problem, such as arthritis, kidney disease, or a skin problem that just never goes away? If so, here’s something you might not have thought about. Feline acupuncture can help with a variety of medical issues that traditional medicine can’t really “fix”. Acupuncture is a traditional Chinese medicine technique that was first used to treat animals in China over 3000 years ago. It involves placing very small, delicate needles into specific acupuncture points on the body to treat various illnesses. 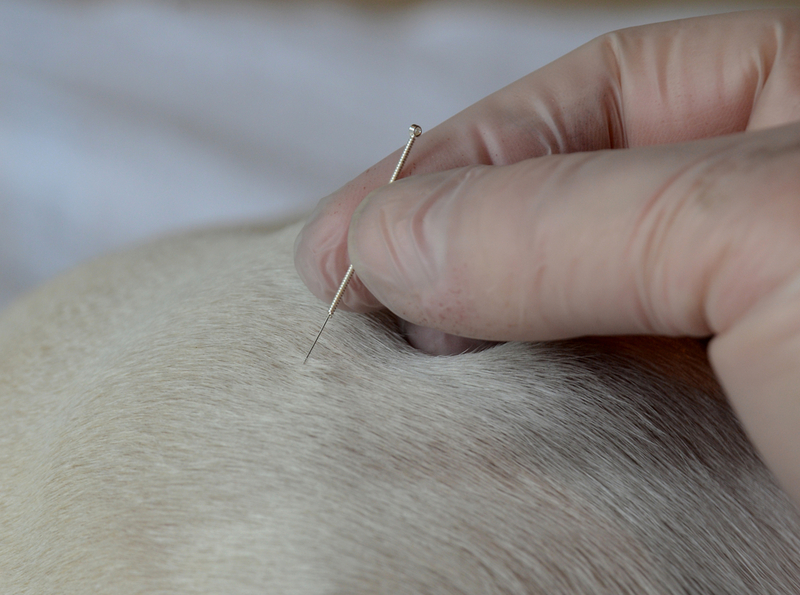 Since I recently completed an intensive six month long veterinary acupuncture certification process through the prestigious Chi Institute of Traditional Chinese Veterinary Medicine (TCVM), and we are now able to offer it to our patients here in Boyds/Germantown, MD. There are several different hypotheses about this. From a Western medicine standpoint, the theory is that the acupuncture points stimulate nerve endings/the nervous system and blood flow. From a TCVM standpoint, it targets and enhances areas of weak “energy” around the body. Regardless of the mechanism, several studies have shown that acupuncture reduces pain and improves quality of life for a variety of conditions in our animal patients. Acupuncture is best known for its ability to provide pain control for conditions such as arthritis, inflammatory diseases, and other chronic pain issues. For example, we’ve been using it to treat senior cats with arthritis, and owners have been giving feedback such as “My cat plays like a kitten again she hasn’t done that in years!” We also use it for a variety of internal medicine conditions (kidney disease, neurological diseases, dermatology issues, etc.). Ask us if acupuncture may be a good option for your cat! But isn’t it all just hocus pocus? Will it really cure my cat? We believe in using acupuncture in an integrative setting. This means integrating it with Western medicine, to offer the best of both worlds and bring the maximum benefit to your pet. It has been shown that in this way we can extend quality of life and life expectancy. Each area is quite powerful on its own, but together they work even better. For example, we were able to use both acupuncture and medications to finally control severe skin disease in one cat when medications alone were not working. Okay, I’m in. What do I have to do? The first step is to schedule an acupuncture consultation with us. The first appointment is 45 minutes and includes the first acupuncture session. Following sessions are 30 minutes each. We achieve the best response from one session once a week for three weeks. Sometimes you will see the effects of the acupuncture after the first session, but sometimes it can take up to three. After the first three weeks, we start staggering the sessions based on your pet’s response. Our goal is to get it down to once every 4-6 weeks. Feel free to give A Cat Clinic a call or send us an email if you have any questions!